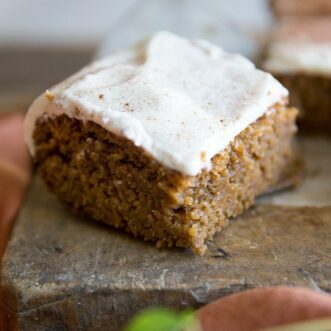 An easy pumpkin cake with cream cheese frosting combines moist cake, perfect spices, and creamy cream cheese frosting. In a mixing bowl, blend together oil and applesauce. Add sugar and pumpkin puree and mix well. Mix in eggs and vanilla. In a separate bowl, mix together flour, baking powder, baking soda, salt, and spices. Add dry ingredients to wet mixture, a little bit at a time, mixing until combined. Pour batter into a parchment-lined 13x9 baking dish and bake for 35 minutes. Let cool before frosting. optional: lightly sprinkle cinnamon over frosted cake. You can make your own pumpkin pie spice with this recipe HERE. It is easy and so delicious!